During the Syrian civil war, a number of units have arisen that receive some kind of Russian backing. One of these units is the ISIS Hunters (Sa'idu Da'esh), about which little concrete information exists. Here, I will provide a brief overview of the ISIS Hunters, drawing in part on the testimony of someone I know in the formation. 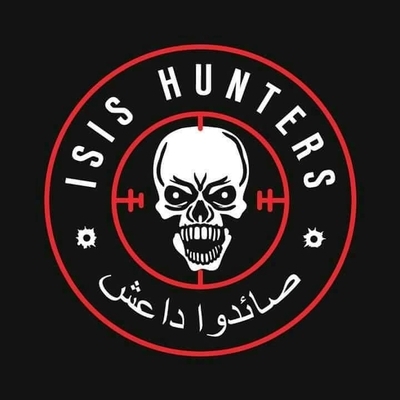 The ISIS Hunters formation was set up around two years ago (i.e. early 2017), as the Syrian government and its allies began their major push through the eastern deserts towards Deir az-Zor province. As its name suggests, the group was set up with the intention of fighting the Islamic State in particular. 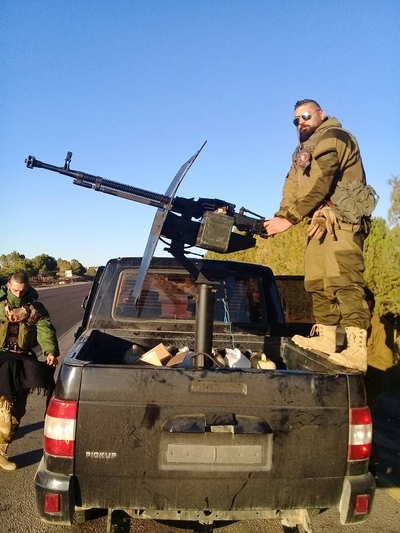 Importantly, the ISIS Hunters is not affiliated with the V Corps collection of formations set up with the backing and oversight of the Russian military. Instead, the ISIS Hunters is its own independent formation outside that framework. In addition, it should be noted that the ISIS Hunters is a volunteer force by nature, and serving in the formation is not tantamount to regular military service in the Syrian armed forces. Recruits for the ISIS Hunters come from a variety of areas, including the coastal region, north Hama countryside (e.g. the town of Suqaylabiyah) and the southeastern Hama countryside (e.g. Salmiya). However, recruitment into the ISIS Hunters is not simply open to anyone. Instead, recruitment is selective on account of the harshness of the training courses, which require the fighter to be familiar with all combat specialities. Nadhim Mikhail Shahada, field commander of the ISIS Hunters, in Deir az-Zor. Notice the Russian flag armpatch. Approximately, the ISIS Hunters has at least 30 'martyrs' from Syrian fighters. A number of these 'martyrs' were killed in U.S. strikes in February 2018 in an incident in Deir az-Zor involving conflict with the Syrian government and its allies. Russians were also killed in this incident, but the person I know in the ISIS Hunters declined to give any further information on this matter. 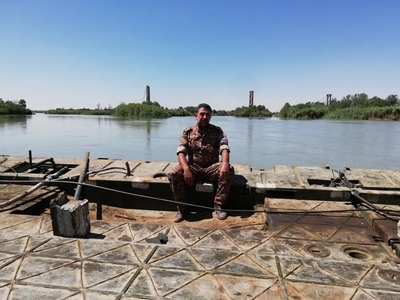 Currently, the ISIS Hunters is undertaking assignments, but here also, no further information could be attained regarding the nature of these assignments.